"I felt a spectrum of emotions, from tears of relief to an experience of pure joy and love. I felt a sense of completeness, a connection to the world and to life; similar to how one may feel pondering the sky on a dark night full of stars; standing at the peak of a tall mountain looking down at a city which appears so small in scale; or experiencing the movement and beauty of the ocean. Imagine, if we carried these positive experiences and feelings along with us in our daily lives, what greatness we could accomplish." "I had just finished a house cleaning job that lasted over 8 hours and my body and back ached and I felt so depleted that I wanted to cancel my appointment. I'm so glad that I didn't. The experience under the Crystal Bath Lights was so relaxing, rejuvenating, regenerating and restoring. I can't believe how energized and great and refreshed that I feel! 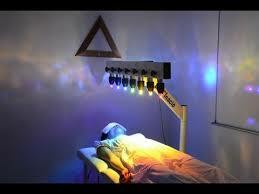 I'm definitely getting one of these treatments atleast twice a week. "OMG!!! I am visiting from the mainland and was so happy to find your Hawaiian Healing Center and Day Spa. I had heard of the miracles of John of God and really wanted to experience the crystal baths.